The 363d Training Squadron trains over 3,800 students annually. Providing the world's best militarily trained graduates, specializing in munitions, armament, and nuclear weapons skills to meet Air Force objectives. Both A1C Joseph E. Rimkus and A1C Joshua E. Woody received their weapons training in the 363d Training Squadron. Building 1045 is dedicated in honor of Staff Sergeant Archibald Mathies who died piloting the crippled B-17 Bomber “Mispah” onto a runway at Glatton, England, on 20 February 1944. S/Sgt Mathies was awarded the Congressional Medal of Honor for conspicuous gallantry and intrepidity at risk of life above and beyond the call of duty. His display of Integrity, Excellence, and Service Before Self shall be an inspiration to all who pass through these halls. The west corridor of building 1045 is dedicated in memory of A1C Joshua E. Woody. A1C Woody was from Corning, California. He entered the Air Force on March 9, 1995. Upon graduation from the F-15 Aircraft Armament Systems Apprentice course on September 11, 1995, he was assigned with the 58th Fighter Squadron at Eglin Air Force Base, Florida. On June 25, 1996, A1C Woody lost his life, along with 18 others, in the fatal bombing of Khobar Towers in Dhahran, Saudi Arabia. A1C Woody will be sadly missed by his family, friends, and fellow Air Force members. He made the greatest sacrifice of all for his country. For this, A1C Woody, we thank you. The east corridor of building 1045 is dedicated in memory of A1C Joseph E. Rimkus. 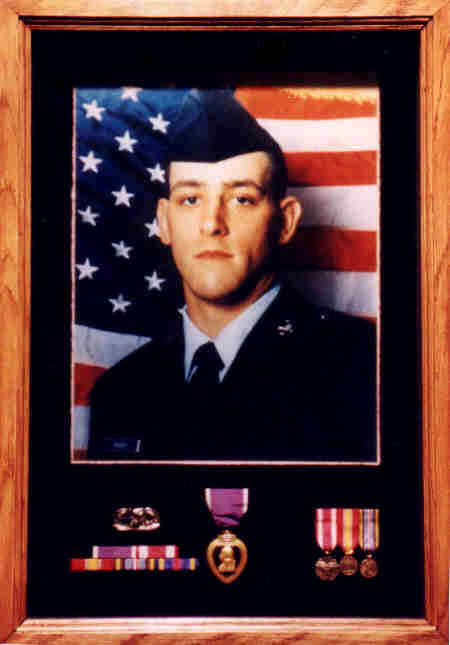 A1C Rimkus was from Crestview, Florida. 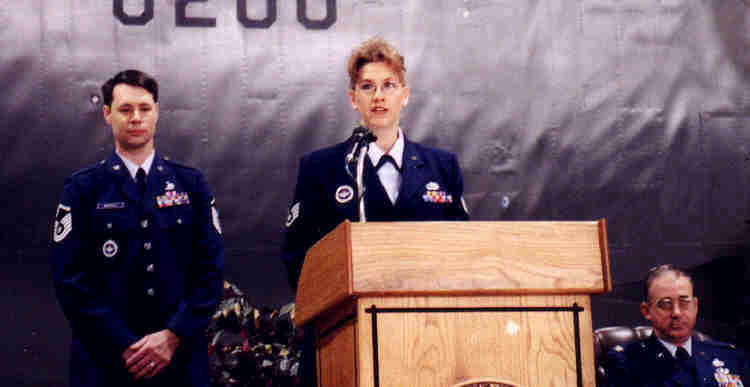 He entered the Air Force on March 8, 1995. Upon graduation from the F-15 Aircraft Armament Systems Apprentice course on August 4, 1995, he was assigned to the 58th Fighter Squadron at Eglin Air Force Base, Florida. On June 25, 1996, A1C Rimkus lost his life, along with 18 others in the tragic bombing of Khobar Towers in Dhahran, Saudi Arabia. A1C Rimkus will be sadly missed by his family, friends, and fellow Air Force members. He made the greatest sacrifice of all for his country. For this, A1C Rimkus, we thank you. Above, The entrance sign to Joseph's corridor. 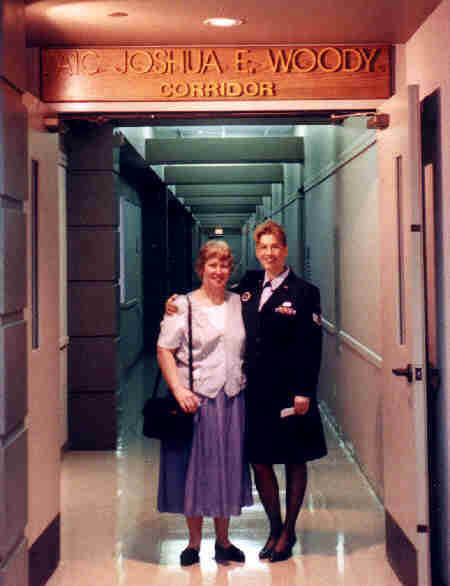 Left, A1C Joshua Woody's Mother, Bernadine Beekman, and SSgt Joy Defosse stand at the entrance to Joshua's corridor.